In this study, we demonstrate that p53 directly inhibits expression of the T cell growth factor (IL-2) in activated T cells. This repression is independent of the intrinsic transcriptional activity of p53 and is mediated by the Tax-responsive CD28RE-3′-12-O-tetradecanoylphorbol-13-acetate response element (AP1) element of the IL-2 promoter. Coexpression of the Tax oncogene causes full reversal of this repression through coordinate targeting of p300, CREB, and the NF-κB pathways. Paradoxically, IL-2 repression by p53 is not reversed by mdm2. Instead, mdm2 represses the IL-2 promoter by a mechanism that is synergistic with p53 and resistant to Tax reversal. The p300 structure-function studies show that these effects are linked to competitive associations among p53, Tax, and mdm2 with multiple domains of p300. The functional outcome of these antagonistic associations is revealed further by the observation that Tax and p53 induce apoptosis in activated T cells through separate and mutually exclusive pathways. Interestingly, both pathways are abrogated by mdm2. These results provide evidence that a dynamic interplay, between Tax and specific elements of the p53 network, mediates growth factor expression and programmed cell death in activated T cells. During an acute immune response, there is generally a very large expansion of Ag specific CD4+ and CD8+ T cells. In most cases, nearly 95% of these cells undergo a well-orchestrated decline in the proliferative response and eventual programmed cell death. This carefully balanced return to homeostasis plays a key role in the proper maintenance of an immune response, and its disruption is often a proximate cause of immune deficiency, autoimmunity, and cancer (1, 2). The p53 tumor suppressor gene is a well-known regulator of cell growth and apoptosis (3, 4). It is mutated in greater than 60% of human tumors and nearly 30% of adult T cell leukemia/lymphomas (5). Mice deficient in p53 not only develop multiple tumors (most of which are lymphomas), but also demonstrate accelerated development and aging of the T cell compartment (6). Thus, p53 plays an essential regulatory role in both illegitimate and immune-responsive T cell proliferation. The function of p53 as a sequence-specific transcription factor is critical to its ability to regulate the expression of the multiple genes that control cellular proliferation and apoptosis. Recent studies have shown that p53 is able to exert this control through its association with a ubiquitous class of large (>2400-aa) transcriptional coregulatory proteins named p300 and CREB-binding protein (CBP)2 (7, 8, 9). Several laboratories have shown that p53 assembles with p300/CBP at the promoters of various p53-dependent genes through multiple protein-protein interactions. In many cases, these assembled complexes lead to direct activation of transcription; in others, these interactions have been proposed to repress (or trans repress) targeted genes through the sequestration of limiting quantities of p300 (10, 11). Whether the end result is activation or repression, an essential feature of p53 action has been its association with p300/CBP-containing complexes that assemble on the regulatory sequence of the target gene. In the past 3 years, at least four different domains along the 2400-aa length of p300/CBP have been found to interact with p53 (7, 9, 12, 13, 14). Moreover, separate N-terminal and core sequences within p53 are capable of independent interactions with p300/CBP (7, 11, 14, 15, 16). Thus, the mechanisms through which p53 is able to act as a master switch to control the expression of several different genes in diverse cellular pathways are likely to be the result of multiple complex interactions with p300/CBP that are selectively interwoven at each affected promoter. The T cell oncogene, Tax, is a product of the human T cell leukemia virus type I (HTLV-1), and is the etiologic agent for adult T cell leukemia. Although it is not clear exactly how Tax transforms human T cells, this property is linked to the ability of Tax to activate the transcription of several pro-proliferation genes including IL-2, IL-2R, c-fos, GM-CSF, and numerous other genes that promote entry into the cell cycle (17). Like p53, a major mechanism through which Tax is able to control the activity of its target genes is by the formation of multiple complexes with p300/CBP (18, 19). Interestingly, Tax has also been found to antagonize the transcriptional activity of p53, although the precise mechanism of this antagonism remains controversial. Several studies suggest that this property arises from a site-specific competition between p53 and Tax for binding domains within p300/CBP, while others suggest that Tax may also induce inhibitory modifications of p53 that abrogate its ability to activate the transcription of target genes (13, 20, 21, 22). Regardless of the mechanism, these collective observations demonstrate that Tax mediates transformation through its dual ability to: 1) up-regulate the expression of genes involved in promoting growth and survival, and 2) inhibit the activity of those genes responsible for restraining growth, survival, and preventing genome instability in HTLV-1-infected cells. Although these overlapping and antagonistic properties of Tax and p53 may predict a precise biological interplay in HTLV-1-infected cells, the potential functional outcome of these interrelations at downstream target genes has yet to be described in lymphoid cells. The T cell growth factor, IL-2, is a p300-controlled gene and a T cell-specific transcriptional target of Tax (23). As such, it is poised to be the focus of a true regulatory convergence between the interlinked and antagonistic functions of p53 and Tax. In this study, we provide evidence that the IL-2 gene, in Tax-expressing cells, is regulated by multiple interactions between the p53 pathway and the molecular processes controlled by Tax. This work is the first observation that the IL-2 promoter can be inhibited in trans by the p53 tumor suppressor, and also demonstrates that both the trans activation and trans repression activities of p53 are abrogated by the Tax oncogene. These combined observations illustrate that convergent targeting of p300 is a common denominator that dictates the differential outcome of cellular fate through its integration of cellular oncogene and tumor suppressor action at downstream effectors. Functional extension of this concept to the in vitro and in vivo analysis of IL-2 and Fas ligand (FasL) activation details a clear regulatory pathway through which both growth factor expression and programmed cell death are cross-regulated by Tax and p53. Jurkat T cells were cultured in RPMI medium containing 10% FCS and 100 U/ml of penicillin and streptomycin (Life Technologies, Gaithersburg, MD) at 37°C in 5% CO2, as previously described (24). Cells were activated with a combination of either 1 μM ionomycin (Calbiochem, La Jolla, CA) and 50 ng/ml PMA (Sigma-Aldrich, St. Louis, MO), or plate-bound (1/200) mAb OKT3 (α-CD3) ascites (American Type Culture Collection, Manassas, VA) and 10 ng/ml PMA. Cell selection was conducted following transfection using the pHook selection system (Invitrogen, Carlsbad, CA), according to the manufacturer’s instructions. Transfection of Jurkat T cells with plasmid reporter and expression vectors was accomplished by electroporation, as previously described (24). Luciferase (LUC) and chloramphenicol acetyltransferase (CAT) assays were performed as described (24). LUC and CAT activity in the lysate from each transfection was normalized for total protein using the Bio-Rad (Hercules, CA) Protein Dye Reagent and expressed as fold activity over that of cells that were either unstimulated, contained the reporter alone, or both. All transient transfection studies were performed in duplicates or triplicates. The error bars expressed in each figure represent SEM. In all cases, each result is representative of at least three independent experiments. The pcDNA 3.1+ (Invitrogen, Carlsbad, CA), CD28RE-3′-12-O-tetradecanoylphorbol-13-acetate response element (TRE)-CAT, IL-2-CAT, IL-2-LUC, UAS-CAT E1B (23, 24), UAS-LUC (25), FasL-LUC (26), p21-LUC (27), mdm2-LUC, and PG13 (9, 28, 29) reporter plasmids have been described previously. The p53 wild-type and mutant expression vectors (p53 (WT), p53 (22, 23), and p53 (273H)) have been previously described (30, 31). The Tax expression vector used in this study was a generous gift from K. T. Jeang (National Institute of Allergy and Infectious Diseases, Bethesda, MD). The wild-type and mutant Tax expression vectors (pcTax (WT), pcTax (M22), pcTax (M47)) were provided by W. Greene (Gladstone Institute of Virology and Immunology, University of California, San Francisco, CA) (23). The Gal4-p300 fusion expression vectors used in this study have been previously described (23, 32). PMA, ionomycin, and mammalian protease inhibitor cocktail were from Sigma-Aldrich. Fas/Fc chimera protein was purchased from R&D Systems (Minneapolis, MN). Abs against p300 were affinity purified, as previously described, from antisera obtained from New Zealand rabbits inoculated with a GST-fusion construct containing aa 1–743 of p300. Anti-mouse and anti-rabbit Abs conjugated with Alexa Fluor 488 or Alexa Fluor 594 were purchased from Molecular Probes (Eugene, OR). Biotinylated oligonucleotides encoding the CD28RE-TRE sequences have been described (23). Streptavidin beads were from Pierce (Rockford, IL). Cytological samples of Jurkat or primary human T cells (0.5–1 × 105 cells/ml) were isolated on glass microscope slides by centrifugation at 600 rpm for 5 min in a Cytospin 3 centrifuge (Shandon, Pittsburgh, PA). Cells were air dried for 1 h and fixed in methanol at −20°C for 30 min, rehydrated with PBS, then permeabilized in PBS containing 1% BSA and 0.5% Triton X-100, and blocked with PBS containing 1% BSA and 10% normal goat serum before staining with primary Ab. Secondary staining with Alexa Fluor-conjugated Abs was performed at 1/250 to 1/400 dilution in PBS with 1% BSA and 1% normal goat serum. Samples were stained for chromosomal DNA by incubation with 4′,6′-diamidino-2-phenylindole at 0.1 μg/ml for 1 min at room temperature. Fluorescent confocal images were collected on a Zeiss (Oberkochen, Germany) Pascal 510 laser-scanning microscope at magnifications of ×40 and ×100, and analyzed using the Zeiss LSM Image Examiner Software v2.5. The p53-programmed nuclear extracts were generated by transfection of 60 × 106 Jurkat cells with 15 μg of p53 expression vector. Following stimulation with phorbol ester and ionomycin for 6 h, the viable cells were isolated by sedimentation on Ficoll gradients. Ficoll-purified cells were washed five times in 4°C PBS, and nuclear extracts were prepared, as described previously (33). DNA affinity precipitations were performed as described with 28-bp biotinylated duplex oligonucleotides encoding a single copy of the IL-2 CD28RE-TRE regulatory sequence (23). Cells cotransfected with the indicated expression vectors and the pHook single chain Ab expression plasmid were selected on Ag-coated magnetic beads, according to the manufacturer’s specifications (Invitrogen, Carlsbad, CA), 6 h following transfection. Cells were resuspended in 5 ml of medium and were either not treated or stimulated with plate-bound α-CD3 Abs and 10 ng/ml PMA for 16–24 h postselection. Following the incubation, the cells were removed by centrifugation, and 4 ml of each supernatant was concentrated to 100 μl using a Microcon-30 Concentrator (Millipore, Bedford, MA). Final IL-2 concentration was determined using the Quantikine IL-2 ELISA kit (R&D Systems) in accordance with the manufacturer’s specifications. Transfected, Ficoll-separated, and PMA/ionomycin (P/I)-stimulated cells were incubated for 7–9 h at 37°C in medium. The cells were isolated on glass slides (6 × 104 cells/slide) by Cytospin centrifugation at 500 rpm for 5 min. Following paraformaldehyde fixation and Triton permeabilization, apoptotic cells were identified by TUNEL assay using the In Situ Cell Death Detection kit (Roche, Basel, Switzerland), according to the manufacturer’s instructions. TUNEL-positive (FITC staining) and TUNEL-negative cells were visualized and counted by fluorescent microscopy. Three representative fields (∼200 cells/field) were counted for the number of TUNEL-positive cells per total cells and reported as mean percent ± SD of the TUNEL-positive (apoptotic) cells. The human Jurkat T cell line expresses IL-2 and is well known for its p53-negative phenotype (34, 35, 36). This reduced functional background provides a suitable experimental system to assess the influence of wild-type and mutant forms of p53 and the Tax on IL-2 expression. As shown in Fig. 1⇓A, enforced expression of Tax and p53 has opposing effects on endogenous IL-2 expression in Jurkat T cells. Although expression of Tax alone causes the expected increase in IL-2 production, expression of p53 induces a near 90% repression. This repression is completely reversed by the coexpression of Tax. Comparable effects of p53 are seen at a transfected reporter construct containing the IL-2-proximal promoter, in which the abrogation of activation of the IL-2 in the presence ofp53 is relieved by the coexpression of Tax (Fig. 1⇓B). Moreover, the IL-2 CD28RE-TRE element, the major tax-responsive regulatory sequence of the IL-2 promoter, behaves in a manner similar to the endogenous gene. As shown in Fig. 1⇓C, repression of the IL-2 CD28RE-TRE by p53 is completely reversed by coexpression of Tax. Selective repression of the IL-2 promoter by p53 is reversed by Tax. A, Jurkat T cells were transfected with PcDNA 3.1+ (3 μg), p53 (3 μg), and/or Tax long terminal repeat (160 ng) expression vectors and stimulated with plate-bound α-CD3 (1/200) and PMA (10 ng) following Ficoll purification. The level of secreted IL-2 was determined by ELISA (see Materials and Methods). B, IL-2-CAT reporter (6 μg) and C, IL-2 CD28RE-TRE response element reporter activity (4 μg) was determined in cells cotransfected with p53 (3 μg) and/or Tax (160 ng), as indicated, and stimulated with phorbol ester (50 ng/ml) and ionomycin (1 mM) (see Materials and Methods). The inhibition of the IL-2 CD28RE-TRE by p53 and its reversal by Tax are both dose-dependent phenomena (see Fig. 2⇓, A and B). As has been shown previously (23), the κB and CREB activation potential of Tax are required for full induction of the IL-2 promoter and the CD28RE-TRE. The Tax mutant M22 is defective in NF-κB signaling, while the Tax mutant M47 is defective in CREB signaling. Both of these mutants are significantly impaired in their ability to reverse the trans repression of the CD28RE-TRE by p53, although the M22 (NF-κB) mutant shows a slightly greater deficit (Fig. 2⇓C). Interplay of Tax and p53 at the IL-2 CD28RE-TRE is dose dependent and requires the CREB and κB trans activation potential of Tax. A, CD28RE-TRE-CAT reporter plasmid (4 μg) was cotransfected into Jurkat T cells in the presence or absence of expression vectors for p300 (3 μg) and p53 (0.25–3 μg). Cells were stimulated by addition of phorbol ester and ionomycin and assayed for reporter activity, as described (see Fig. 1⇑). B, CD28RE-TRE-CAT reporter was cotransfected into Jurkat cells with or without the combined addition of expression vectors for Tax (40–240 ng), p300 (3 μg), and p53 (3 μg), as indicated. 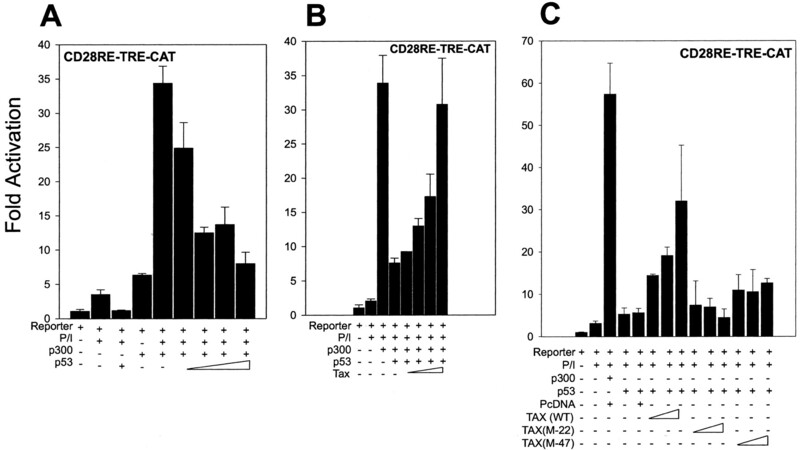 C, CD28RE-TRE-CAT reporter was cotransfected into Jurkat T cells with and without the combined addition of expression vectors for p300 (3 μg), p53 (3 μg), empty vector (pcDNA3.1, 3 μg), and 2–5 μg of either wild-type Tax or the M47 (CREB-defective) and M22 (κB-defective) Tax mutants, as indicated. Cells were harvested and assayed for CAT activity (see Materials and Methods). In addition to Tax, mdm2 is also a well-known regulator of p53 through its ability to form transcriptionally inactive complexes with p53 that mediate its nuclear export and degradation (37). As shown on an artificial promoter containing multiple tandem copies of a consensus p53 response element (PG13), the addition of either Tax or mdm2 leads to significant down-regulation of transcription (Fig. 3⇓A). Although Tax is well able to repress the mdm2 promoter when coexpressed with p53 (Fig. 3⇓B), its combination with p53 produces synergistic activation of the p21 promoter (Fig. 3⇓C). Thus, trans repression of p53 by Tax is highly promoter specific. The ability of p53 to trans repress target genes does not require its transcriptional activity. Variants of p53 with a mutation in either its DNA binding (p53 273H) or trans activation domain (p53 M22, 23) show minimum activation of the p53 reporter (Fig. 3⇓A). However, both mutants retain significant ability to trans repress the IL-2 CD28RE-TRE. The M22, 23 mutant retains 50% of wild-type activity, while the 273H mutant retains nearly 90% of wild-type inhibitory activity (Fig. 3⇓D). The antagonism between p53 and Tax is promoter specific and independent of p53 transcriptional activity. A, Jurkat cells were cotransfected with the p53-inducible reporter pG13-luc (1 μg) with and without the addition of expression vectors for wild-type p53 (3 μg), the p53 double point mutant M22, 23 (3 μg), the p53 mutant 273H (3 μg), Tax expression vectors (160 ng), and mdm2 (5 μg). B and C Jurkat T cells were transfected with a mdm2-luc reporter (4 μg) or a p21-luc reporter (4 μg) with and without the addition of expression vectors for Tax (160 ng) and p53 (3 μg). D, Jurkat cells were cotransfected with CD28RE-TRE-CAT reporter (4 μg) and increasing (2–5 μg) amounts of either wild-type or mutant (M22, 23, or 273H) p53 with or without the addition of an expression vector for p300 (3 μg), as indicated. Cells were stimulated and harvested, as described (see Fig. 1⇑). Several laboratories have shown that p53 influences the transcription of regulated genes through a direct interaction with p300 that either recruits it to active promoters, or conversely, impedes the activation of p300-targeted genes through sequestration and/or steric inhibition (38, 39). The p300/CBP has two well-described trans activation domains, in its C terminus and N terminus, whose modular nature confers robust transcriptional activity to hybrid fusions containing the DNA binding domain of Gal4. 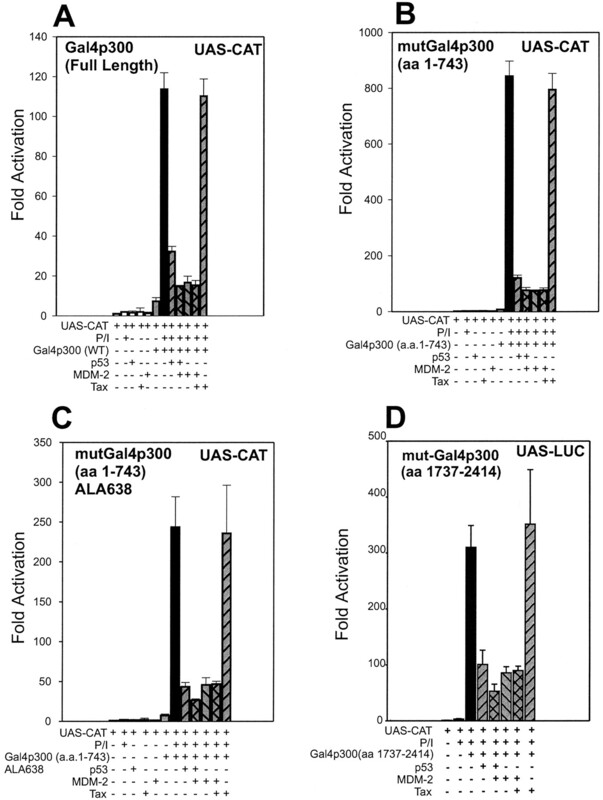 When such Gal4 fusions are expressed with a reporter driven by the sequence-specific recognition site for Gal4 (UAS), they readily activate transcription. An analysis of the influence of combinations of Tax and p53 on the intrinsic transcriptional potential of full-length and truncation mutants of p300 is presented in Fig. 4⇓. As shown in Fig. 4⇓A, the intrinsic transcriptional activity of full-length p300 is significantly repressed in the presence of p53, and this repression is partially reverse by coexpression of Tax. Expression of Tax alone has minimal effect. Moreover, both p300 N- and C-terminal fusions with Gal4 are repressed by p53 in a manner that is readily reversed by coexpression of Tax (Fig. 4⇓, A, B, and D). The p53 represses the intrinsic trans activation potential of multiple p300 domains. 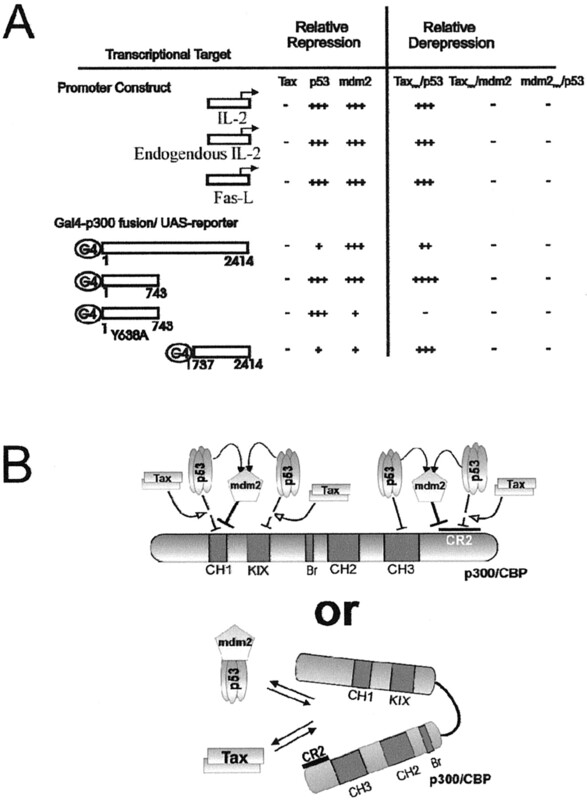 Jurkat cells were cotransfected with the UAS-CAT reporter plasmid and: A, a Gal4-p300 (full-length) expression vector; B, a Gal4-p300 fusion mutant containing only the 1–743 N-terminal residues of p300; C, a Gal4-p300 1- to 743-aa N-terminal fusion vector containing a Y638A substitution; and D, a Gal4-p300 C-terminal fusion expression vector containing residues 1737–2414 of p300, each with and without the combined additions of p53 (3 μg) and Tax (160 ng) expression vectors, as indicated. Transfected cells were stimulated, harvested, and assayed for reporter activity, as in Fig. 1⇑. The ability of Tax to reverse the repression by p53 is dependent, at least in part, on a direct interaction with the p300. Tax has been shown in the past to interact with p300 at multiple domains (18, 40, 41, 42). One of these is referred to as the N-terminal KIX (Creb interaction) domain (18). Although Gal4-p300 N-terminal fusions carrying a single amino acid substitution (Y638A) (43) in the KIX domain of p300 are fully capable of transcriptional activation, they cannot be rescued from p53 repression by coexpression of Tax (Fig. 4⇑C). These findings suggest that part of the mechanism underlying the transcriptional repression of p300 by p53 involves domain-specific interactions with p300. 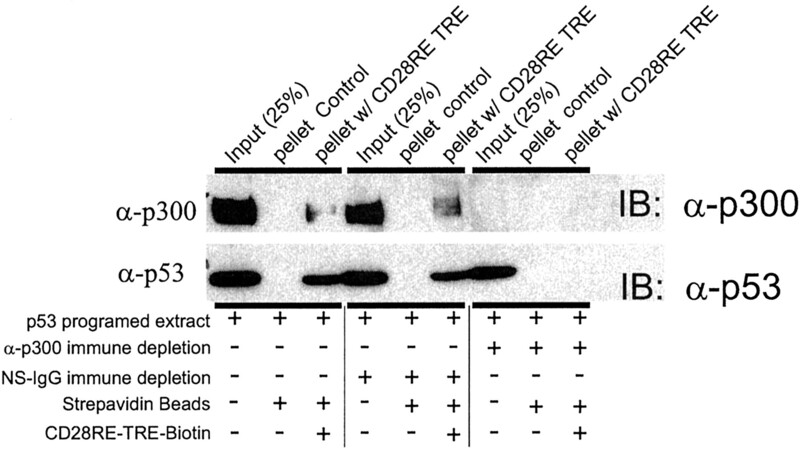 This correlation is further supported by the reduced ability of the p53 M22, 23 mutant (by comparison with the 273H mutant) to trans repress the IL-2 CD28RE-TRE (see Fig. 3⇑D). Prior studies have shown that the M22, 23 mutant has a markedly reduced affinity for the CBP/p300 class of transcriptional coactivators (7). Thus, reversal of the repression is likely to result from competitive displacement of p53 from a common or overlapping domain by Tax. A finding that was critical to the understanding of mechanism of p300/CBP involvement in p53 signaling was the demonstration that p53 could assemble onto target DNA in complexes with p300 (9, 39). Similarly, p53 forms complexes on the CD28RE-TRE element in vitro in the absence of a DNA-binding p53 consensus sequence. Jurkat nuclear extracts, programmed to express wild-type p53 by transfection, were used to assess the ability of p53 to form complexes with biotinylated duplex DNA, encoding the CD28RE-TRE element, via a DNA affinity precipitation assay (Fig. 5⇓). Bound protein-DNA complexes were separated from free by sedimentation with avidin-coated beads. As shown in Fig. 5⇓, p53 was readily affinity precipitated with avidin beads only in the presence of the CD28RE-TRE element. This precipitation required the presence of p300 because immunodepletion of the extracts with p300-specific Ab resulted in complete loss of p53 from the CD28RE-TRE element. Depletion of the programmed nuclear extract with nonspecific Ab did not interfere with the DNA affinity precipitation of p53. Thus, p53 is likely to exert most of its effect on repression of the IL-2 promoter through the direct formation of an inhibitory DNA-protein complex, containing p300 and p53, at the IL-2 CD28RE-TRE element. The p53 assembly at the IL-2 CD28RE-TRE requires p300. Nuclear extracts were prepared from Jurkat cells programmed to overexpress p53 by transfection (see Materials and Methods). Extracts were either untreated or treated by immunodepletion with nonspecific (NS) or anti-p300 Abs. Supernatants were then incubated with 1 mg/ml salmon sperm DNA in the presence or absence of biotinylated duplex oligonucleotides encoding the CD28RE-TRE sequence. DNA-bound protein was separated from free by sedimentation on avidin-coated beads (Neutra-avidin). DNA affinity-precipitated protein was measured for protein by Western blot analysis in comparison with 25% of input (see Materials and Methods). Top panel, Anti-p300 immunoblot. Bottom panel, Anti-p53 immunoblot. The mdm2 is a well-known regulator of p53 through its ability to induce nuclear export and degradation of p53 by the ubiquitin pathway (4). Therefore, it was anticipated that mdm2 would readily reverse the p53 repression of the IL-2 promoter. Unexpectedly, mdm2 did not reverse the repression of IL-2, but instead, acted in synergy with p53 (Fig. 6⇓A). As shown in Fig. 6⇓A, either p53 or mdm2 can inhibit activation of the endogenous IL-2 gene, and their coexpression leads to superrepression. Similarly, transcriptional activation of both the IL-2 reporter and the isolated CD28RE-TRE element is synergistically repressed by p53 and mdm2 (Fig. 6⇓, B and C). The p53 repression of the IL-2 promoter is not reversed by mdm2. A, Jurkat T cells were transfected with PcDNA 3.1+ (3 μg), p53 (3 μg), and/or mdm2 (5 μg) expression vectors and stimulated with plate-bound α-CD3 (1/200) and PMA (10 ng) following Ficoll purification. The level of secreted IL-2 was determined, as described in Fig. 1⇑. 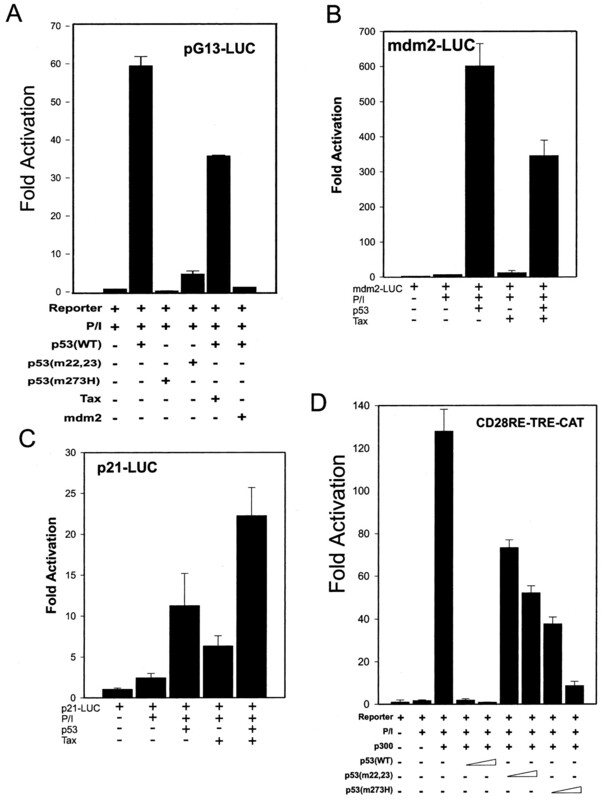 B, IL-2-CAT reporter (6 μg) and C, IL-2 CD28RE-TRE response element reporter activity was determined in cells cotransfected with p53 (3 μg) and/or mdm2 (5 μg), as indicated. Cells were stimulated and harvested, as described in Fig. 1⇑. The mechanism through which mdm2 is able to mediate repression of p300-controlled promoters is currently unknown. Several laboratories have reported that mdm2 is able to form stable complexes with p300 through interactions with its N-terminal domains (14, 16, 44). In some of these reports, this interaction has been shown to participate in competitive displacement of trans-acting factors from the p300 N terminus (16). To investigate the role of mdm2-p300 interaction in the repression of the IL-2 promoter, mdm2 was expressed in reporter assays using the Gal4-p300 fusion constructs described above. As shown in Fig. 7⇓, coexpression of mdm2 is able to cause transcriptional repression of each Gal4 fusion with p300, including the full-length, the C-terminal truncation, the N-terminal truncation, and the N-terminal truncation with a point mutation in the KIX domain. This repression is increased by coexpression of p53 and is completely resistant to reversal by Tax (Fig. 7⇓). The mdm2 directly represses the intrinsic trans activation potential of p300 independent of p53 and Tax. 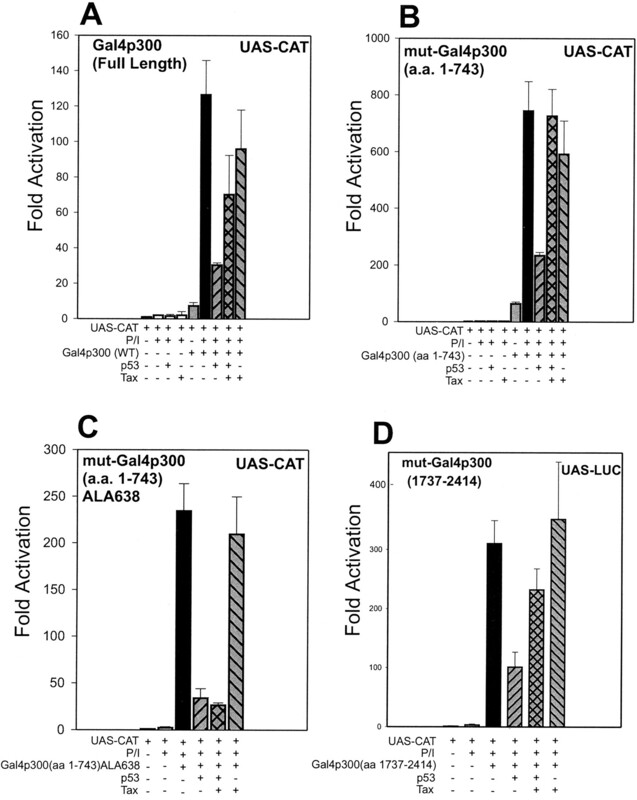 Jurkat cells were cotransfected with the UAS-CAT reporter plasmid (4 μg) and: A, a Gal4-p300 (full-length) expression vector (3 μg); B, a Gal4-p300 fusion mutant containing only the 1–743 N-terminal residues of p300 (3 μg); C, a Gal4-p300 1- to 743-aa N-terminal fusion vector containing a Y638A substitution (3 μg); and D, a Gal4-p300 C-terminal fusion expression vector containing residues 1737–2414 of p300 (3 μg), each with and without the indicated addition of p53 (3 μg) and Tax (160 ng) expression vectors. Transfected cells were stimulated, harvested, and assayed for reporter activity, as described in Fig. 1⇑. As shown above, the linked interplay between Tax and p53, when compared with that between mdm2 and p53, is functionally distinct. Although mdm2 antagonizes p53-dependent trans activation in a manner similar to Tax (see Fig. 3⇑A), it conversely synergizes with p53-dependent trans repression of the IL-2 promoter and p300. These functional differences are reflected morphologically in experiments that examine the subcellular localization of p53 when coexpressed with Tax in lymphoid cells. Immunofluorescent detection of p53 and p300 in cells transfected with p53 shows a high level of nuclear localization of p53 in a manner similar to p300 (Fig. 8⇓, top). 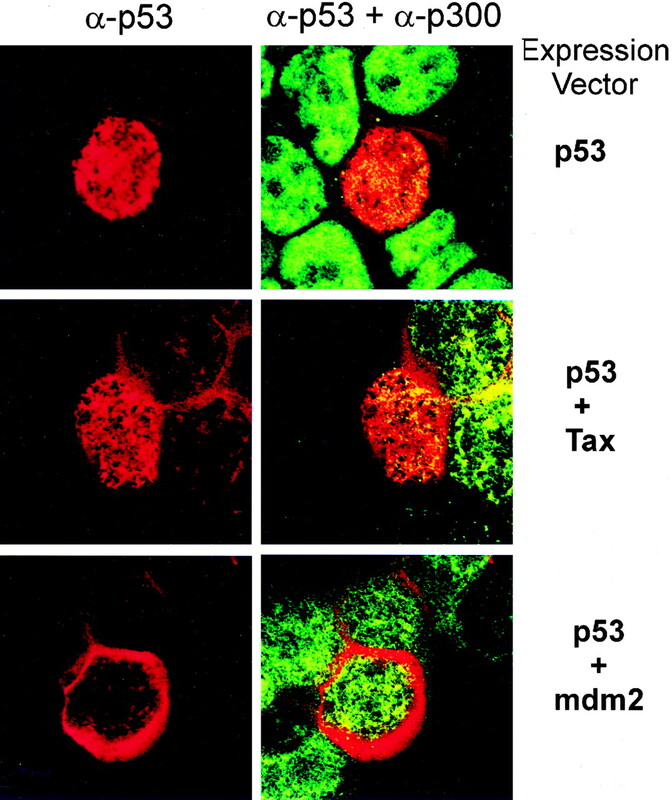 Although coexpression of Tax and p53 does not alter the nuclear accumulation of p53 (Fig. 8⇓, middle), the coexpression of p53 and mdm2 leads to significant exclusion of p53 from the nucleus (Fig. 8⇓, bottom). Tax and mdm2 induce distinct changes in the subcellular localization of p53. Jurkat cells were cotransfected with p53 expression vectors (3 μg) and empty vector (pcDNA, 3 μg), top panel; tax expression vector (160 ng), middle panel; or mdm2 expression vector (3 μg), bottom panel. Endogenous and transfected protein were visualized by immunofluorescence (anti-p53, red; anti-p300, green), as described in Materials and Methods. Both p53 and Tax previously have been shown to induce apoptosis in lymphoid cells, although the precise mechanism of their effects remains to be determined (45, 46, 47). As shown in Fig. 9⇓A, enforced expression of p53 or Tax in activated Jurkat cells is associated with a marked increase in apoptosis (Fig. 9⇓A). As expected, this p53-dependent apoptosis is completely abolished by coexpression of mdm2; however, coexpression of Tax and p53 together results in a significant decrease in apoptosis below the level induced by either factor alone. One of the pathways through which Tax can induce apoptosis is by activation of FasL expression (47). To investigate the influence of p53 on this pathway, FasL reporter assays were conducted in the presence and absence of Tax and p53. Tax expression in Jurkat T cells leads to a dramatic up-regulation of the FasL promoter. Both this Tax-induced activation and the endogenous activation of the FasL reporter are significantly inhibited by coexpression of wild-type p53 (Fig. 9⇓B). Interestingly, this repression is not reversed by the addition of mdm2. In fact, expression of mdm2 caused significant repression of both endogenous and Tax-induced activation of the FasL promoter (Fig. 9⇓B). Finally, Tax-expressing Jurkat cells are rescued from apoptosis via receptor blockade by the addition of Fas/Fc (a soluble Fas-IgG fusion that acts as a competitive inhibitor of FasL) (48) (Fig. 9⇓C). Jurkat cells overexpressing p53 are not rescued, and the cross-abrogation of Tax-induced apoptosis by the expression p53 is uninfluenced by this treatment (Fig. 9⇓C). Consistent with the FasL reporter observations (Fig. 9⇓B), mdm2 continues to show a superdominant effect: repressing both Tax-dependent and p53-induced apoptosis. Thus, Tax and p53 induce apoptosis through mutually exclusive pathways that intersect to create a functional antagonism at the level of FasL expression and action. Apoptotic pathways induced by p53 and Tax are mutually exclusive. A, Jurkat cells were cotransfected with combinations of empty vector (pcDNA, 5 μg), p53 expression vector (3 μg), Tax expression vector (160 ng), and mdm2 (5 μg), as indicated. Following transfection, cells were Ficoll purified and P/I stimulated for 8 h. Apoptotic cells were identified on glass slides by the TUNEL assay (see Materials and Methods). B, Jurkat cells were cotransfected with a FasL-luc reporter plasmid (4 μg) and combinations of expression vectors for Tax (160 ng), mdm2 (5 μg), and p53 (3 μg), as indicated. Cells were stimulated, harvested, and assayed for reporter activity, as described in Materials and Methods. C, Cells were cotransfected with combinations of empty vector (pcDNA 3.1, 5 μg), and expression vectors for p53 (3 μg), mdm2 (5 μg), and Tax (160 ng), as indicated. Subsequent to Ficoll purification, cells were split in half, and one-half was preincubated with 0.04 μg/ml mouse Fas/Fc chimera protein before stimulation with P/I. Cells were harvested 8 h later, and apoptotic cells were identified on glass slides by TUNEL assay, as described in A (see Materials and Methods). Both p53 and the HTLV-I oncogene tax interact with multiple domains of the p300/CBP. In this study, we show a well-circumscribed interplay between these factors that is manifested functionally by promoter-specific transcriptional cross-regulation of genes induced during T cell activation. Enforced expression of p53 in Jurkat cells results in significant repression of both endogenous and exogenous IL-2 promoter activation. This repression is independent of the transcriptional activity of p53, and is readily reversed by coexpression of the HTLV-1 Tax oncogene. Structure function analysis shows that much of this interplay is dictated at the level of specific interactions and/or influences of Tax and p53 at multiple domains throughout the length of p300. In vitro DNA-binding studies show that p53 is able to form stable complexes on sequences of the IL-2 promoter that have an absolute dependence on the presence of p300, thus suggesting that p53 represses IL-2 gene expression through the formation of an inhibitory complex at the IL-2 promoter. Although p53 transcriptional activity is not necessary for repression of the IL-2 promoter, the presence of its downstream target and negative feedback regulator, mdm2, leads to synergistic repression of IL-2 expression instead of rescue. Additional functional sequelae of the antagonism between the p53 network and Tax are revealed by the differential effects of these factors on apoptosis. These differences are highlighted by the surprising finding that the p53 and Tax induce cell death through mutually exclusive pathways in activated T cells, resulting in higher cell survival when coexpressed together than when either are expressed alone. The ability of p53 to trans repress target genes has been a well-recognized aspect of p53 function that was initially observed over a decade ago (49, 50, 51). The finding that p300/CBP coregulator complexes could form stable interactions with p53 led to the general conceptual consensus that the inhibitory effect of p53 could be explained by competitive interactions between p53 and various transcription factors for finite binding sites on limiting amounts of nuclear CBP/p300. The relative validity of this concept was established in numerous studies that showed that overexpression of p300/CBP could ultimately relieve or rescue cells from their repressed states (reviewed in Ref. 38). What has remained to be established is what form this level of competition ultimately takes within the microenvironment of the nucleus. Two distinct models for this competition have emerged. In one model, promoter-targeted transcription factors compete for limiting amounts of available p300/CBP in the nucleus, and therefore, depending on cellular context, actively sequester p300 away from specific gene clusters in favor of function at selected gene cassettes. In a second general model, competition exists at the level of steric interference. p300/CBP engages in specific gene regulation through the differential formation of active multicomponent complexes at the promoters. By this mode of regulation, the binding of p53 to sites on p300 disrupts appropriate assembly of the promoter-specific complex through steric hindrance. Although both models are dependent on a direct interaction between p300/CBP and p53, the former model also requires sequence-specific interactions with promoters that are envisioned to be competing for available p300/CBP. Thus, the first model would require that the sequence-specific DNA-binding activity of p53 remain intact. As shown in Fig. 3⇑B, a tumor-derived DNA-binding mutation in p53 (273H) retained near wild-type activity in repression of IL-2 regulatory sequences, while the p53 mutant of p53 that is defective in p300/CBP interactions (M22, 23) shows significantly reduced repression. The p53 interacts with p300 along four different stretches of its primary sequence (see schematic summary in Fig. 10⇓B). It binds to the very C terminus of p300 via its N-terminal sequences (7, 12). A second binding site, with apparent lower affinity, is located within the CH3 domain (7, 9). A third binding site that interacts with the core domain of p53 is located in the CH1 domain of p300, and the KIX domain of p300/CBP is the fourth region of p300 demonstrated to interact with p53 (13, 14). At present, it is not clear whether these multiple binding sites for p53 act independently or are assembled into a single binding pocket(s) through tertiary folding of the p300 structure (see Fig. 10⇓B, alternative structure). Nonetheless, the Gal4-p300 fusion assay shows that p53 targeting of at least three of four of these domains results in significant repression of the intrinsic transcriptional activity of p300 (summarized in Fig. 10⇓A). This suggests that the p53-binding activity retained by the isolated p300 segments is sufficient to be functionally relevant (see Figs. 4⇑ and 7⇑). Although both of these models provide a unifying framework upon which the results from multiple laboratories can be explained, they do not distinguish between the mechanisms of sequestration vs that of steric hindrance that have been proposed as explanations for the trans repression of p300-dependent genes, as described above. Notwithstanding, the binding pocket proposed in the alternative model (Fig. 10⇓B) implies that multiple allosteric interactions could exist along the length of p300/CBP that could be targeted for regulation by a variety of protein:protein interactions and covalent modifications. The p300 targeting by the interplay between Tax and the p53 network: schematic summary and conceptual model. A, Data from Figs. 1⇑, 2⇑, 4⇑, 6⇑, and 9⇑ are schematically summarized in tabloid format. Cotransfection results from studies with promoter constructs and Gal4-p300 fusions are indicated. Relative effects of Tax, p53, and mdm2 expression vectors, alone or in combination, on repression and reversal of repression are shown. B, Conceptual model showing alternate interpretations of the multiple effects of Tax, p53, and mdm2 on p300-dependent trans activation. Filled arrowheads indicate induced expression. Flat arrowheads indicate points of repression. Open arrowheads indicate points of reversal of repression. The alternative model suggests that multiple Tax- and p53-interacting domains within p300 combine to form a single binding surface in which Tax and p53 are mutually exclusive. Tax has also been shown to interact with multiple regions of p300. The KIX domain of p300/CBP is one of the best-characterized Tax interaction sites (42, 52). Recent work by Lemasson and Nyborg (53) has defined two additional domains, one located in the CH1 domain of p300, and the other located at far C terminus of p300, a domain that has been characterized previously to interact with SRC-1 and p53 (19). As in the case of p53, it is not clear whether these interactions represent separate binding sites or reflect multiple binding interfaces within a single binding pocket of the p300 tertiary structure. The significant overlap between the Tax-binding sites of p300 and the p53-binding regions (see above) certainly suggests that p53 and Tax interactions may be mutually exclusive. Nonetheless, a simple competition between Tax and p53 for binding sites within p300 does not appear to be the only explanation for the ability of Tax to rescue p300-controlled promoters from p53 trans repression (22). Tax expression has pleiotropic direct and indirect effects on nuclear and cytoplasmic processes within the cell. Two of these effects are related to the ability of separate domains within Tax to up-regulate CREB and rel/κB transcriptional activity. Both of these factors have binding sites in or near the KIX domain of p300. Thus, in addition to binding directly to p300, Tax induces the nuclear activity of factors that may also limit the accessibility of p53 to domains within p300. This possibility is supported by the finding that Tax mutants deficient in the ability to induce either CREB or rel/κB activity (M47 and M22 mutants, respectively) are also deficient in reversing p53 repression, although the M22 mutant appears more defective (Fig. 2⇑C). Finally, Tax induces a differential phosphorylation of p53, and this activity has been linked to its ability to inhibit p53-dependent activation of target genes (22). The work described in this study does not address the competence of different phosphorylation states of p53 to participate in trans repression of target genes. Nonetheless, it is noteworthy that mutations within the KIX domain of p300 block the ability of Tax to reverse the p53-induced repression of the activity of the p300 N-terminal trans activation domain (Fig. 4⇑C). This implies that a direct association between Tax and p300 is a required step in reversing the repression. However, the reported inability of the M22 Tax mutant to induce the tax-dependent phosphorylation of p53 suggests that both competitive and noncompetitive influences of Tax on p53 may contribute to the cross-regulation (22). The role of mdm2 as a negative regulator of p53 through increased p53 degradation and nuclear export is well known. That is why the inability of mdm2 to reverse the p53-induced repression of the IL-2 promoter and p300 trans activation domains was surprising (see Figs. 6⇑ and 7⇑). However, this observation is consistent with a prior report that mdm2 possesses an intrinsic transcriptional repression domain located adjacent to its p300 interaction domain (54). Although not completely characterized, the action of this mdm2 domain appears to be specific for TATA-containing promoters and is linked to its ability to interfere with basal transcriptional machinery. It may be that the mdm2 interaction with p300 and p53 may aid in its targeting of genes for repression. The presence of p53 enhances the stability and specificity of the repressive p300/p53/mdm2 complexes until p53, and possibly p300 are ubiquitinated. Thus, p53-dependent repression of p300-controlled genes must occur in two sequential stages. The first stage is due to the action of p53 alone, is independent of its transcriptional activity (see Fig. 3⇑), and can be reversed by the expression of Tax. The second stage requires the transcriptional activity of p53. This consequently increases mdm2 levels, which results in a more profound and Tax-resistant repression (see Figs. 6⇑, 7⇑, and 8⇑). The targeting of p300 by mdm2 is likely to be the primary mechanism through which mdm2 is able to antagonize the apoptotic pathways induced by Tax and p53 (see Fig. 9⇑) and may contribute to the reported ability of mdm2 overexpression to contribute to tumorigenesis independent of p53 (55). The ability of Tax to induce apoptosis in T cells through the up-regulation of FasL expression and its antagonism by coexpression of p53 may provide insights into the different mechanisms of tumor induction by the oncogenic viruses. The transforming proteins of several oncogenic viruses interact with the p53 tumor suppressor protein to alter its function. The SV40 large T Ag and the adenovirus E1B protein form complexes with p53 that both stabilize its levels while disabling its function (56, 57, 58). The E6 protein of the human papilloma virus forms a complex with p53 that ultimately leads to it degradation through the ubiquitin-directed pathway (59). What is common to these tumor virus proteins and the endogenous regulation of p53 by mdm2 is that they all disable p53 function through a mechanism that has significant effects on the compartmentalization and the steady state levels of p53. These properties are clearly distinct from the activity of Tax. Although Tax does influence many of the activities of p53, it does not lead to dramatic changes in either its levels or its subcellular localization (compare effects of mdm2 and Tax on p53 in Fig. 8⇑). These findings in addition to the observation that few, if any, tumors of T cell origin are associated with loss of heterozygosity at the p53 locus (60) suggest that some aspect of p53 action must be retained during the initial transformation process. The finding that p53 can antagonize the induction of apoptosis by Tax expression in activated T cells suggests that this may be a point of symbiosis between Tax and p53. Work by Rivera-Walsh et al. (45) clearly demonstrates that Tax expression can also induce apoptosis through T cell activation-independent (and therefore FasL-independent) pathways by the up-regulation of the TNF-related apoptosis-inducing ligand gene in response to chronic overexpression of Tax. By striking a balance between tax-regulated pathways of T cell proliferation and activation-induced cell death, it is therefore likely that both the activation state of the T cell and the steady state levels of p53 may be critical determining factors in whether HTLV-1 infection results in cellular transformation. 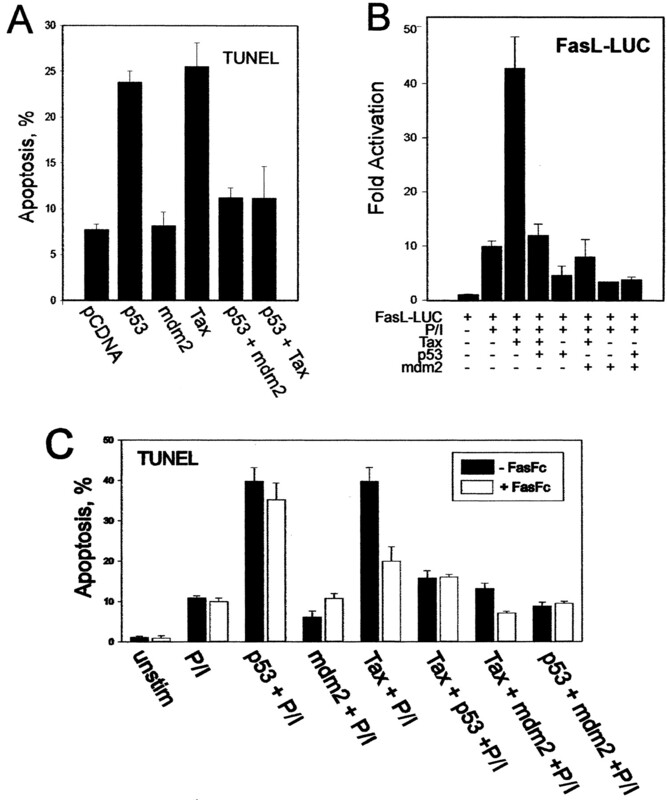 The demonstration of the upstream linkage of Tax expression and FasL-induced apoptosis (see Fig. 9⇑) adds credence to this hypothesis. IL-2 also plays an active role in promoting apoptosis in activated T cells through its ability to increase FasL expression and suppress the FLIP inhibitor of Fas-induced cell death (61). This paradoxical function of IL-2 suggests that a complicated and kinetically determined hierarchy of interactions and targeting by Tax and p53 may exist that must proceed through thresholds during the course of T cell activation. Thus, the early symbiosis between Tax and p53 must give way to other secondary events during later stages of T cell activation as cells acquire high affinity IL-2R and become more susceptible to apoptosis. The nature of these secondary events is not clear, but they are likely to result from the increasing genetic instability of the proliferating T cells due to the down-regulation of p53 by Tax. These secondary events are also likely to contribute to the mechanisms through which HTLV-1-infected cells eventually become IL-2 and Tax independent as they evolve into tumors (62). Although prior Tax transgenic studies show accelerated Tax-dependent tumor growth in heterozygous p53 null mice, the early demise of the homozygous p53 mice from Tax-independent tumors makes it hard to determine whether there is a true dose-dependent role for p53 in Tax-induced cellular transformation (63, 64). Future studies designed to compare the ability of infectious clones of HTLV-1 to immortalize wild-type vs p53 heterozygous or homozygous null lymphocytes would be better able to test this hypothesis. The finding that elevated levels of p53 and mdm2 can antagonize IL-2 expression in activated T cells suggests the possibility that the p53 network may have a role in negative feedback inhibition of proliferation and cytokine gene expression. Although p53 levels are elevated in activated T cells (65), it is not clear whether during normal T cell activation, the presence of p53 and later mdm2 serves to limit IL-2 expression. Studies with p53 knockout mice show increased proliferation of the deficient cells (6), yet detailed studies that examine differences in cytokine production are not available. Several studies have reported that environmental exposures to DNA damage agents, including chemotherapeutic drugs, ionizing radiation, naturally occurring heavy metals, and pesticides, will elevate the levels of p53 in peripheral blood lymphocytes (66). Our data predict that these exposures can lead to a chronic immunosuppression of naive and memory T cells characterized by down-regulation of IL-2 expression through activation of the p53 network. Finally, the interaction and functional outcome of the association of Tax and p53 with multiple domains within p300/CBP have been described by numerous labs; however, the precise manner in which these interactions target and ultimately influence the expression of cellular genes has received little attention. Fig. 10⇑A presents a rudimentary conceptual summary of how such interactions influence various p300-targeted promoters in vitro. Whether the implications of these observations will have application to our understanding of how the variety of p300-controlled promoters are regulated in vivo will require approaches that place these regulatory systems in a more physiological context. The ability to obtain kinetic and spatial information on protein-protein and protein-DNA interaction through chromatin precipitation assays promises to be a very powerful approach in the future to identify those in vitro determined biochemical interactions that have biological relevance in vivo. ↵2 Abbreviations used in this paper: CBP, CREB-binding protein; CAT, chloramphenicol acetyltransferase; FasL, Fas ligand; HTLV, human T cell leukemia virus; LUC, luciferase; P/I, PMA and ionomycin.